Fibre optic Christmas trees are a clever, colourful and unique alternative to traditional Christmas tree lighting. Rather than having twinkling points of light, a fibre optic tree glows all over, filling the room with its illumination. Instead of regular needles, a fibre optic tree has needles of fine plastic or glass with a reflective coating. An LED light shines at the base of these fibres, and light is conducted through them to produce a bright glow. Depending on the type of tree you choose the light can be a single colour, multicoloured, or even switch back and forth. There are two main types of fibre optic Christmas tree: a tree made entirely of optical fibres for a brilliant, clean look. Or an artificial Christmas tree that incorporates optical fibres among their needles, for a more traditional look. Older fibre optic Christmas trees used a motor, halogen lights and a plastic colour wheel to produce their effects. Unfortunately these designs were hot, noisy, energy-gobbling and unreliable. Modern fibre optic Christmas trees use LED lights instead of regular incandescent bulbs, so they consume less electricity and produce almost no heat. These trees can be adorned with your own decorations and lights, just like any other tree. Since the fibre lights are heat-less, you need not worry about damage to your ornaments. Some trees come with their own fibre optic ornaments already attached. 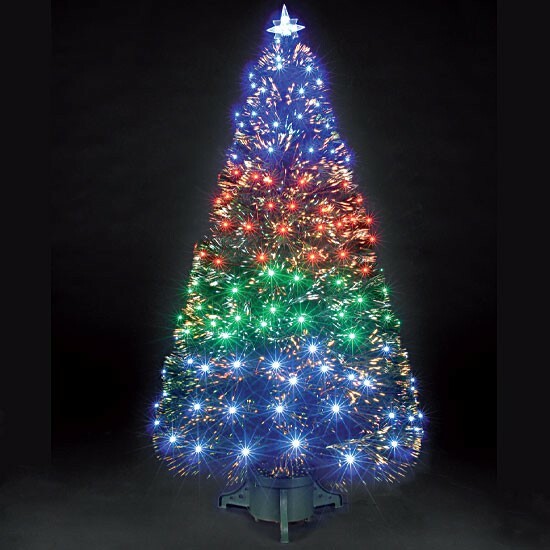 Fibre optic Christmas trees are available in a variety of sizes. From tiny tabletop trees that plug into your computer’s USB port, to full-sized trees of 7 feet or more. When Christmas time is over be sure to store the tree safely away from moisture and debris. A well-maintained fibre optic Christmas tree can last you a lifetime.